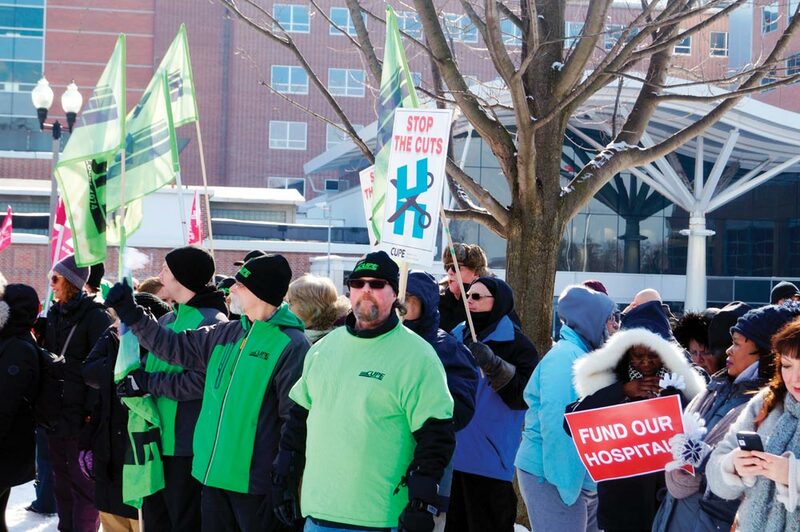 More than 700 health care workers converged on Lakeridge Health in Oshawa to demand increased funding for hospitals and long-term care homes. The rally was one of just a few that have taken place over the past few weeks, including previous stops in Toronto, Hamilton, and Burlington. Michael Hurley, president of the Ontario Council of Hospital Unions, said Ontario has the lowest per-capita hospital funding of any province in Canada, and furthermore, anywhere in the developed world. For the past eight years, Hurley said Ontario hospitals have seen budgets either decreased or frozen by the Liberal government. Pointing to nearby Lakeridge Health, he stated the Oshawa hospital requires about a five per cent yearly budget increase to meet its “medical needs” and is used at 100 per cent capacity. According to him, the purpose of the rally was to put pressure on all three of Ontario’s major political parties to increase hospital funding. The Liberals have pledged to raise funding 3.5 per cent in 2018-19 if re-elected, with the NDP promising a smaller increase. Should the PC Party form government in June, Hurley believes there would be “budget cuts” to hospital funding. Candace Rennick, secretary/treasurer for CUPE Ontario, said the union is calling for the province to implement a minimum standard of four hours of daily care for residents of long-term care homes. According to Rennick, the Liberals claim the average of daily care currently stands at three-and-a-half hours. However, for her, the government’s calculations are misleading, as they include employees who are on vacation or in training. In October, France Gelinas, NDP MPP for Nickel Belt, introduced Bill 33, known as the Time to Care Act, which if passed, would implement the four-hour minimum care standard CUPE is seeking. The bill has received a first and second reading and has been referred to the Standing Committee on General Government. As far the Conservatives are concerned, Rennick said CUPE has heard “nothing concrete” on the matter. Rennick said with an aging population, needs of long-term care residents have increased from the past.